A new generation of all-electric, inland container barges is under development by an entrepreneurial Dutch company, writes David Tinsley. 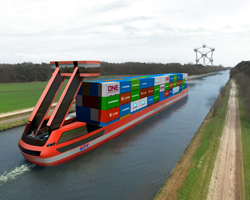 Huissen-based Port-Liner Holding, founded by Ton van Meegen, has implemented plans for battery-powered, zero-emission barges designed to trade on the northwest European waterway network. The E-PortLiner flotilla will serve scheduled operations between inland terminals and deep-sea ports in the Amsterdam/Rotterdam/Antwerp (ARA) range. Although Port-Liner Holding’s primary focus is on battery-electric propulsion, the company is also eyeing possibilities with regard to hydrogen fuel. The liquid organic hydrogen carrier (LOHC) system proposed by H2-Industries of Germany is regarded as an ideal fit with the Dutch firm’s core battery technology. This could lead to a battery/hydrogen powering configuration, also helping to accelerate the introduction of zero-emission shipping to the inland waterways, and suitable not only for newbuilds but for retrofit applications. Port-Liner Holding indicated to Ship & Boat International that while it is actively engaged in work on the LOHC solution, the immediate aim is to realise the E-PortLiner concept with battery-electric propulsion. The envisaged programme involves two sizes of container barge – of 52m and 110m in length, respectively. Core to the E-PortLiner is a containerised battery system, known as the E-Powerbox, designed for easy re-charging by cable at berth – or, alternatively, for exchange after discharge with a fully charged unit. The standard E-Powerbox was initially attributed a rating of 1.6MW, and it was calculated that a 110m barge with four E-Powerboxes would have an operating radius of about 23 hours / 230km.The portable E-Powerboxes will be stored aft under the vessel’s elevating wheelhouse. Ship & Boat International was recently advised by van Meegen that the first barge to enter service will indeed have four E-Powerboxes and, furthermore, that there had been an advance in power ratings: “With our current technology, it will be 2MW per E-Powerbox,” he confirmed. Vessel construction will take place at Shipyard Millingen, with initial deliveries expected during Q2 2019. Through the EU’s Connecting Europe Facility (CEF), a grant of €6.8 million (US$7.7 million) was approved to support the development of the first series of E-Powerboxes, amounting to 49 units.In addition, the Port of Antwerp awarded a subsidy of €200,000 (US$227,000) for the development of a regular service between an intermodal terminal in the southern Netherlands and Antwerp using Port-Liner barges, estimated to save 23,000 truck movements per year. Anticipated route coverage by the new fleet is understood to include the German inland hub of Duisburg, on the Rhine, and Tilburg, on the Netherlands’ Wilhelminakanaal. Meanwhile, Port-Liner Holding is cooperating with H2-Industries for the development of an all-electric inland vessel employing LOHC energy storage technology. A pilot vessel, developed primarily for testing/demonstration purposes but with scope for commercial operations, should be ready by the end of 2019. The higher storage capacity and energy density of LOHC powering, relative to the energy storage capability associated with batteries, will provide greater endurance to cover longer transport distances. LOHC is an oil-like liquid that binds hydrogen through a chemical process, allowing hydrogen storage without the need for refrigeration or pressurisation and enabling the hydrogen energy to be released on demand. Hydrogen released from the LOHC liquid is converted into electricity, using an integrated fuel cell, powering electric motors for propulsion. Hydrogen-loaded LOHC is flame-retardant and non-explosive. Containerised storage in four 20ft units is claimed to provide a power reserve about 20 times greater than batteries of the same volume.The organic oil-like substance can be stored and transported in the same way as diesel: with the LOHC system, the substance can also be charged with hydrogen as often as required. The fuelling solution enables virtually silent, vibration-free electric motor propulsion and onboard power generation, eliminating CO2, NOx, particulate matter (PM) and soot emissions.